Springtime around Edina, MN is one of the most beautiful times of the year. The cold weather has gone away and the hot summer air has not yet arrived. This serves as a perfect time to boost the curb appeal of your home and invest in Exterior Remodeling Services. Bannochie Builders, Inc. is a licensed and local Minnesota contractor ready to help with your remodeling needs. Stop putting off those projects and take the initiative to make those exterior home improvement dreams come true this spring! With over 20 years of experience, our dedicated staff have been turning dreams into reality for many individuals in the community. As a family owned business, treating the customer like one of our family members is a top priority. With nearly 50,000 residents in Edina, MN, we try and maintain that small town feel within our company. By teaming up with our crew, you will receive affordable pricing, efficient service, quality upgrades and superior customer service. You have nothing to lose as we offer free consultations with one of our staff members. Deck/Patio Creations – Most people do not realize just how nice it is to have a nice deck installed, until you actually have one. By adding a deck to your residence, you are able to create more space for hosting friends and family. Maybe you’d like a seating area to sit back and relax. Crank up that grill this spring and enjoy the amazing weather! 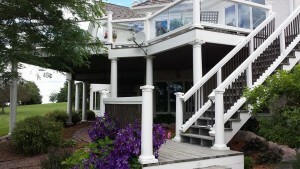 Customization is our specialty, and we can even match the deck or patio with the flow of your home. Having a deck or patio offers a great resale value if you decide to put your house on the market as well. Window Installation – Reduce those energy bills today by replacing your old, leaky windows. We offer a wide variety of windows to choose from ranging from the double hung, patio, sliding, garden, bay and bow windows. Over time, these new windows will pay off thanks to the amount of energy you save in the future! Roofing Upgrades – There is no more important part of the exterior of a home than the roof. This is the primary protector of the largest investment that most individuals make in a lifetime. A new roof can change the look of your home dramatically. Our experienced staff can handle your roofing needs at any capacity. So, it is time to take advantage of this wonderful spring time weather in Edina, MN. Partner with Bannochie Builders, Inc. for all of your exterior remodeling needs. Give us a call at (763) 574-0131 to set up a free consultation today. This entry was posted	on Friday, May 15th, 2015 at 3:23 pm	and is filed under Exterior Home Remodeling MN. You can follow any responses to this entry through the RSS 2.0 feed. You can leave a response, or trackback from your own site.